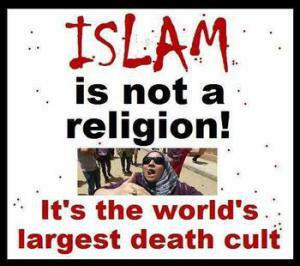 The islamic Cult of Death Strikes Again…in London – I Am Not Ashamed Of The Gospel Of Christ! BE AWARE OF WHAT IT IS, AND FLEE FROM IT. DO NOT LISTEN TO THE “RELIGIOUSLY CORRECT” IN THE LYING JUDAS CHURCH SYSTEM IN AMERICA. The UK/English leadership have lost their collective minds. There are five people dead and others terribly injured from a follower of the false prophet mohammad and the bloodthirsty demon god allah, and the members of parliament will not even defend their own people. They are so anxious to be politically correct it is sickening. Read the quran or excerpts from it. See what islam REALLY is. Death and butchery are commanded by mohammad. Specifically to Jews and Christians. Read the historic information about islam and its 1,400 year record of bloodshed and subjugation of all in its path. Read about the butchery of Jews and Christians, and anyone who disagreed, as commanded by the demon possessed false prophet mohammad. You will then wonder why the DEMENTED LEADERS OF THE WEST HAVE DECIDED NOT TO STAND UP TO THIS SATANIC ENTITY. The natural peoples of Europe have been sold into great danger by their lying and foolish politicians. They have placed them in grave danger. The natural citizens of those lands cannot walk the streets safely any more. The Criminal obama and his handlers have tried to do the same to America. The people of GOD must repent and cry out to The LORD+. Listen to HIM+ for direction, for how to be kept safe. Judgment still sits on America as a whole, but The LORD+ knows how to keep those who are TRULY HIS+. Check David Woods Channel when you can, much truth about islam there. No, we do not hate muslims. Many are trapped in terrible situations they cannot get out of, especially the women. islam must be exposed for what it is so that many trapped in it can be set free. Meanwhile, do not listen to the politically correct so called “leaders”. They are either fools or they are bought and payed for. ‹ Does hell really exist?